The “good” feel­ings that we move to­wards, and the “bad” feel­ings that we move away from. (then there’s the neu­tral ones we hang around in some­times but that’s for an­other time). Char­lie the five year old goes on a car­ni­val ride. Char­lie the five year old throws up. Char­lie the five year old learns that car­ni­val rides make you feel ter­rible. In (one of many) healthy wor­lds: When char­lie turns ten, his friends ask him to go to the car­ni­val again. Char­lie re­al­ises that the car­ni­val ride might be differ­ent now, he fuels him­self with a bit of peer pres­sure and he runs a new ex­per­i­ment, push­ing back on the ter­rible feel­ing that he would usu­ally avoid and rewrites his in­cli­na­tion to avoid ter­rible things. Con­se­quently char­lie re­learns that a car­ni­val ride is only some­times ter­rible and with the sup­port of friends it can be good. In (one of many) un­healthy wor­lds: When char­lie turns ten, his friends ask him to go to the car­ni­val again. Char­lie re­mem­bers that the car­ni­val rides feel ter­rible and de­cides not to go to the car­ni­val. This re­in­forces the ter­rible feel­ing. Char­lie feels en­tirely jus­tified in avoid­ing a ter­rible thing, his friends don’t re­ally care ei­ther way and life goes on. Char­lie keep­ing a tiny re­in­forced ex­pe­rience that he should avoid ter­rible things. Ob­jec­tively speak­ing, a car­ni­val ride is not ter­rible or good. Sub­jec­tively, the feel­ings we at­tach to such ex­pe­riences are what guides us in fu­ture ex­pe­riences. Rightly or wrongly, all pos­si­ble fu­tures for char­lie are go­ing to be guided by the pos­si­bil­ity that those emo­tions will come up. In an ideal world, our emo­tions, our s1 will be trained ac­cu­rately from our sur­round­ings. In pre­his­toric times, we avoid the crocodile lake be­cause we feel scared of the dan­ger there. The hu­mans who didn’t feel scared of the dan­ger, didn’t avoid the lake, didn’t live, and didn’t pass on their genes. Un­for­tu­nately we don’t live in an ideal world for emo­tional train­ing, and de­spite the best of in­ten­tions we can still wind up with emo­tional maps that don’t help us to win at life. The good news is that we can re-train our early emo­tional mod­els of the world. The bad news is that it’s prob­a­bly the hard­est thing I’ve ever done, and peo­ple spend years med­i­tat­ing on moun­tain tops for equa­nim­ity to­wards all ex­pe­riences. With that in mind—let’s be­gin. To start—ask your­self, “How am I feel­ing?“. That will give you an en­try point. There’s always an en­try point. Even if it’s con­fused, or I feel like not do­ing this ex­er­cise right now, or I feel like be­ing dis­tracted by that other tab. Then ask, “What is it like be­ing me right now feel­ing X?”. This ques­tion de­vel­ops a re­la­tion­ship to the thought­stream. Re­peat the ques­tion with the new find, “What does it feel like be­ing me right now feel­ing X?”. Build­ing the on­go­ing re­la­tion­ship with the thought­stream. Th­ese paths fur­ther each might open up into other feel­ing paths. What does it feel like to be the clown any­way? What does it feel like to be the per­son laugh­ing at the clown here? What does it feel like to be poked fun at? What does it feel like be­ing me right now, feel­ing em­pow­ered? What if I did the op­po­site? How would that feel? What does it feel like be­ing scared like this right now? What does it feel like to miss out right now? What does it feel like to be stuck in the class­room? What does it feel like to be heavy in the chest right now? How am I feel­ing right now? What is it like be­ing me right now feel­ing con­fused? What is it like be­ing me right now feel­ing silly? What does it feel like to be the clown? And on­ward through sev­eral feel­ings. At some point, it be­comes use­ful to not run from a feel­ing to the next feel­ing, and in­stead sit on it for a mo­ment. That might be af­ter 10, 20 or 30+ differ­ent stops along the jour­ney. (in the in­ter­est of be­ing brief I’m go­ing to stop at 8 in­stead of 30) At 8, that means feel­ing em­bar­rassed, but in­stead of ask­ing my­self for the an­swer of what it feels like to feel em­bar­rassed—I stop and try to feel what it feels like to feel em­bar­rassed. In­stead of look­ing for a word un­der­neath em­bar­rassed, I feel the feel­ing of em­bar­rassed. And wait. And it’s un­com­fortable, but to get dis­tracted by the un­com­fortable feel­ing would be to leave em­bar­rassed. So I go back to em­bar­rassed. And it gets heavy. And to get dis­tracted onto heavy would be to not be em­bar­rassed any more. And it feels like some­thing is crush­ing my chest, and it’s get­ting tighter. And it might crush me, and I might not breathe. And I wait. And then it stops crush­ing. And it soft­ens, and it eases, and it lev­els out to a differ­ent feel­ing. And I take a deep breath. And I feel calm. A very deep sense of calm. I feel like I’d be okay be­ing em­bar­rassed. As long as I re­mem­ber that there’s a sense of calm un­der­neath. And I feel calm. And I feel re­lieved, and com­plete. And that’s what it feels like to feel an un­com­fortable feel­ing and get to the other side. That’s what it feels like to un­train the car­ni­val ride effect. Life is prop­a­gated by two main clusters of emo­tions. Yeah that’s not bad. 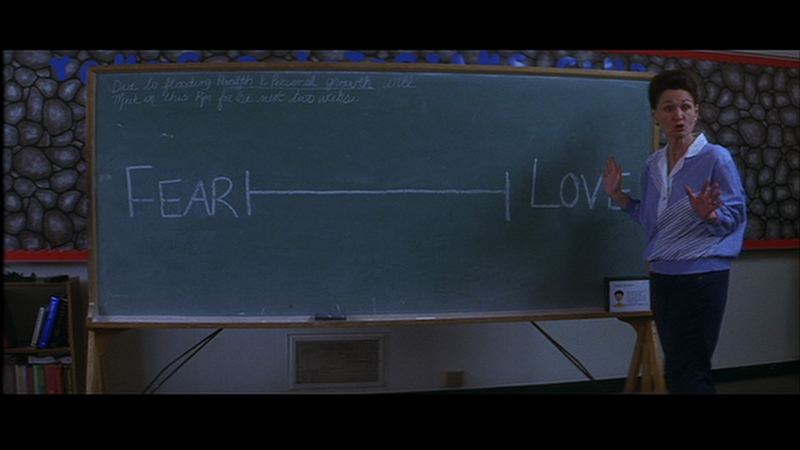 Roughly “the ones we like, the ones we don’t like” so fear/​love yeah. Ex­cept there’s other flavours of each. Won­der­ful, feels ex­actly like my own path to self-knowl­edge. Look­ing for­ward to the next parts. What should I do when I don’t feel calm and/​or re­lived af­ter feel­ing what I re­ally feel for a long time? Do you feel like you hit the depth of the feel­ing or only ap­proached it in a shal­low way? Do you feel like you hit the crux of the feel­ing or just one of the ones along the way? Also—what do you feel like you should do? I would sug­gest ex­plor­ing nearby feel­ings. Often I have had trou­ble with things that were “too ob­vi­ous” and I didn’t think would be the prob­lem. It doesn’t hurt to rule them out. Some good clues there. Very rele­vant to some­one in need of that path­way.